We’ve been working with ebooks for several years now, but this marks the second time we’ve utilized print-on-demand services concurrently with producing an ebook. (The first was the similar relaunch of Elizabeth’s Jake Hines series with Triple Play.) Below are some lessons learned from the process regarding the print-on-demand cover and its relationship to the ebook cover. The Print-on-Demand cover will be easier if you already know the book’s specifications. In particular, knowing the spine size from the start will prevent the need for alterations later in the game. More fundamentally, you should commit to your book dimensions (e.g. 5.5″ x 8.5″ vs 6″x9″), whether the cover will be glossy or matte, your paper weight, and your page count before getting too deep in cover design. Not only do you need the cover dimensions, paper stock, and page count to calculate the spine width, but aesthetic decisions such as glossy or matte can be a factor in the basic artistic decisions you make for your cover. Also, you will need to have book metadata set in stone (title, author, and publisher, obviously, but also the list price) before you submit your final cover design. Takeaway: It is much easier to crop down and reduce a full-resolution print cover to create a smaller ebook cover than to take a mid-res ebook cover and transform it into something print-ready. 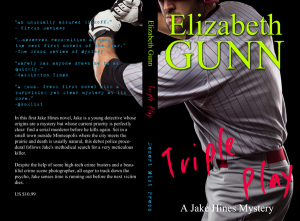 When we republished Elizabeth Gunn’s first Jake Hines Mystery, Triple Play, the plan was initially only for an ebook release. So I designed the ebook cover before anything else. However, we finally ended up looking at print-on-demand through Createspace. I had no idea, until I actually sat down to prepare the print cover from the ebook cover, just how much rejiggering it entailed. A good ebook cover is laid out at least 1400 px wide. But a useable print cover for a 5.5″ x 8.5″ book at a minimum of 300 dpi works out to at least 1650 wide (front only). 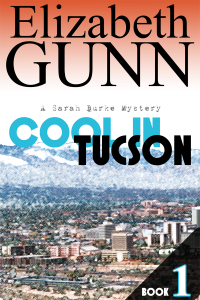 Of course, I discovered I’d elected the bare passable minimum for my ebook cover, 1400 px. I either had to enlarge the graphic (losing quality) or rebuild it from the original stock at a higher res. I did the latter. Also–obviously–an ebook cover is only the front. 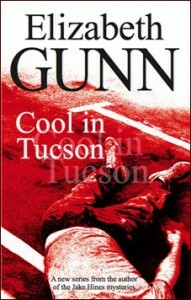 The print cover must include the spine and back cover. This is a consideration and labor expense I expected, but I wasn’t thinking about bleed and safe zones when I originally did the ebook cover. That proved to be a bit of a problem, and it also was a factor that led to rebuilding the cover from the stock. 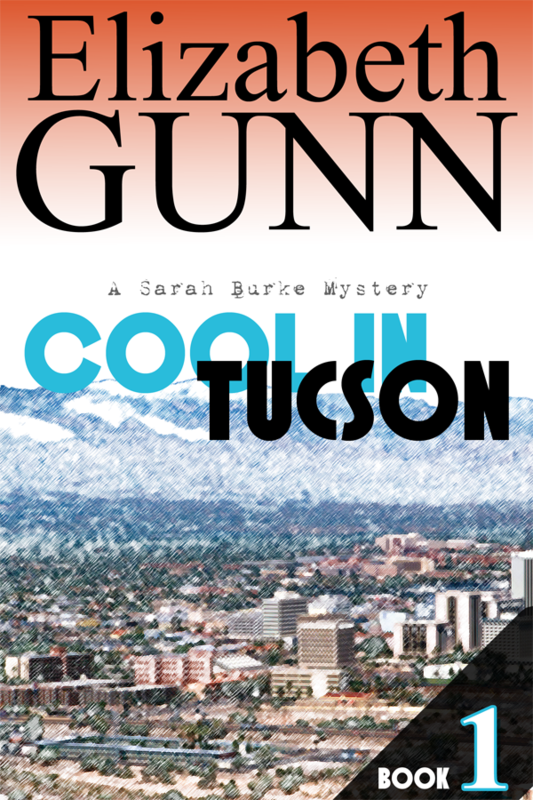 So for the reprint of Cool in Tucson, I knew I had to do the print cover first, even though for the content I was starting with the ebook. 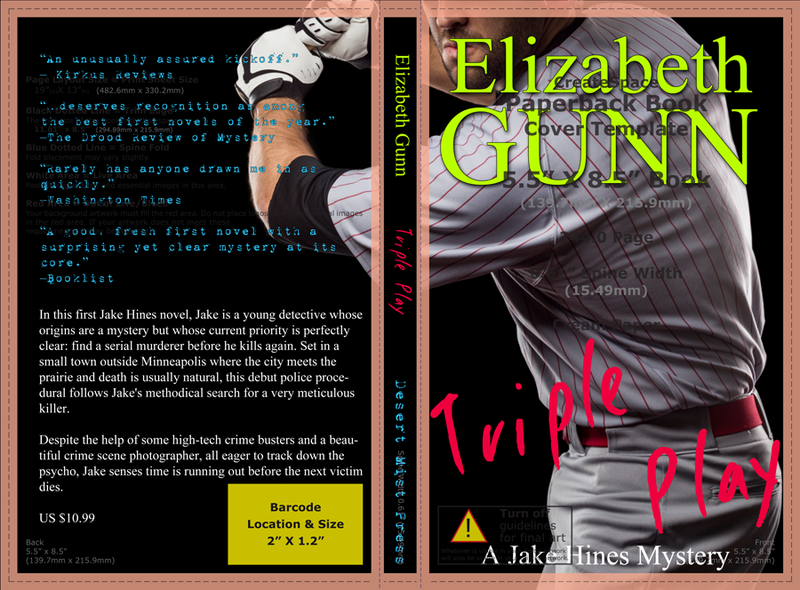 Then when I had all the requirements for the print cover fulfilled, it was easy to adapt for ebook. Createspace provides you with templates you can include as a layer in your Photoshop composition. These show the required bleed, the cut line, the safe zone, the spine width, and the barcode placement. 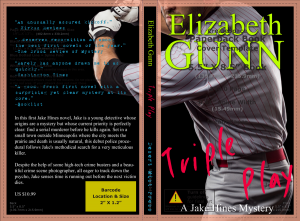 Click the thumbnail to see the Createspace cover template superimposed on Triple Play. 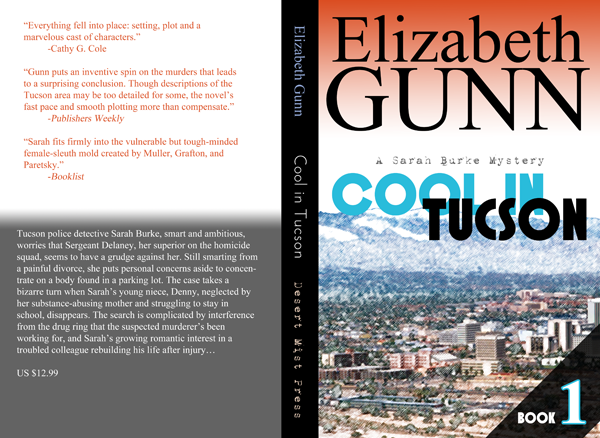 I would show you Cool in Tucson, but I changed the spine late in the game, causing it to stray from the template I have. Createspace is very transparent with print cover requirements. You only need understand the terminology to use the template. Bleed, or extension of background elements beyond the cutting line to allow for variation in cutting. Trim line, or where the blade ideally does its thing, but it’s not a perfect world, is it? Safe zone, or where foreground elements are definitely safe from getting chopped or folded. Creating the ebook cover (right) from the print-on-demand cover (above) was relatively easy. It was a little more than a simple crop and resize, only because the ebook standard ratio of 2:3 is different from the 5.5″ x 8.5″ dimensions we chose for the print editions. As a result, I cropped some dead space from the top and bottom to attain 2:3. Fortunately, the layout allowed me to get away with this and I did not need to tweak the placement of any elements. Of course, that would have been unnecessary if we picked 6×9 for the print. But even so, it was a heckuva lot easier than my experience going the other direction.